I finally finished my Zipline Shell (ravelry details here) this weekend. I completed the majority of it in the car on the way to and from North Dakota, because it’s that easy to crochet. I knew I might want to modify it around the shoulders and neckline, so I waited to do those areas at home after a first blocking just for sanity’s sake. I made a few slight modifications for me. First, I had a slightly looser gauge with the Hempathy yarn (even with a 2.75 mm hook) so I made the second size, which worked out just perfectly. I also made the straps (which almost turn sleeve-like in the original) thinner, so it is more of a tank. Now that it’s all done I kind of wish I’d left them alone, but, probably only because I haven’t seen my pasty arms in a while. Once I blocked it and sewed up all the pieces, I tried it on again BEFORE weaving in the ends. I really suggest you do this too, with any garment you make that allows it. 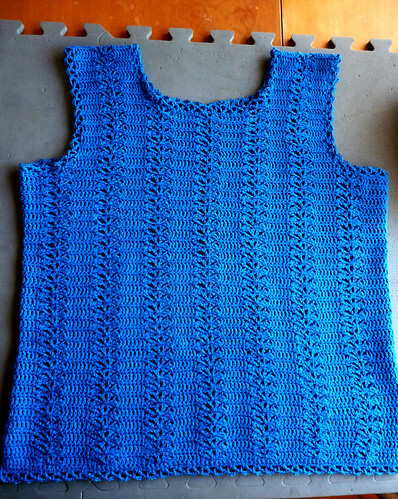 I found that I needed to lose about 6 rows in each shoulder for it to fit me as desired –otherwise the armholes were a bit too deep and neckline a little low (this might have been because I was going between sizes with my altered gauge). Taking those rows out raised the neckline (and I’d already made it a bit higher for my version), so if I wanted to go crazy I could have ripped out all of the straps and re-crocheted that part too, but I chose not to. I’m really happy with how it came out and I think it’s a totally wearable piece. Ok, maybe when it gets a little cooler than 105 and I can bring myself to wear two layers. The Hempathy is really breathable and gets softer and softer each time I wash it, and I just LOVE this color. The first time I worked with Hempathy I really didn’t like how it felt in my hands, for whatever reason (maybe because I was alternating it with soft mohair, and the contrast was just too much?). But this time around I liked it much better. Although it’s a little bit harder on my hands than a springy merino wool, I would use it again in a heartbeat. All told, I used 7 skeins (really, 6.5 skeins, or just under 1000 yards). I’m wearing it with about 1″ of ease and I love the fit. 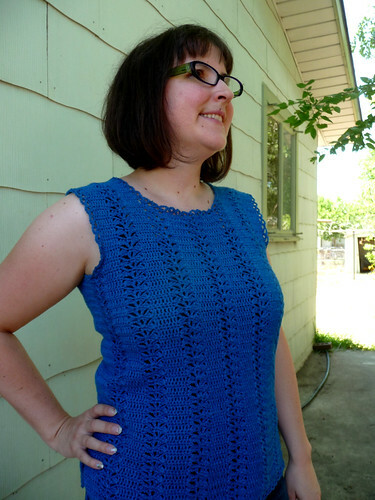 There are a few shells popping up on Ravelry, and so far they all look great! ***Just an FYI, While I was crocheting this, I noticed that the shell was photographed inside-out in Interweave Crochet. It’s not a big deal, but it’s a bit more textured on the inside than the outside. I’m not sure how that happened, but in case you thought yours didn’t look quite like the picture, this would explain it. Hey, now it’s reversible! Stunning colour, definitely a pattern that's going on my to do list. Really love the simplicty of the pattern and it look swearable too.